Yesterday I listed a beautiful 1920s silk velvet coat of purple velvet with grey silk lining on the webshop. The quality was self-evident: the lushness of the fabric, the generosity of the cut, the detail in the construction. The silk lining is unbelievably soft: more luxurious than any modern silk. The original label was inside and also, spoke of quality. This exceptional piece sold quickly and prior to packing her up and sending her to her new home, I did a little googling about the maker. We all know that Regent St in London is one of the best shopping destinations – the border between Mayfair and Soho. Home to Hamley’s and the beautiful Liberty, and many other major retailers. Not surprisingly, every building in the street is heritage listed. A business that occupied numbers 252 to 264 would be a very large and successful one – today these shops are occupied by many retailers including Monsoon and Natwest. It’s right near Oxford Circus, and I walked past these buildings every day when I worked around the corner for a fashion wholesaler in 1992. I discovered that in the 19th century this part of Regent Street was the home of mourning dress with many shops dedicated to its wares. Peter Robinson’s was one of the largest – originally occupying the whole block from 250 to 264, and as demand changed, so did the shops: in 1894 they occupied 256-264 and in 1909 it could be found at 252-264. This suggests the garment was made after 1909. The cocoon coat is such a distinctive style: introduced by Paul Poiret in 1913, this one could be from the ‘teens or it could be the early ’20s – I always date pieces as the most recent possible, to err on the side of caution but the construction, materials and label suggest this one is probably from the earlier end of that spectrum. It came from the wardrobe of a lady who also wore Poiret and Chanel. An advert for Peter Robinson’s from the Illustrated London News 1885. The Victorians were big on mourning and the proper fashion: for a period of up to several years they would wear black after the death of a loved one, followed by a period of “half-morning” when the colours of grey and purple would be introduced. 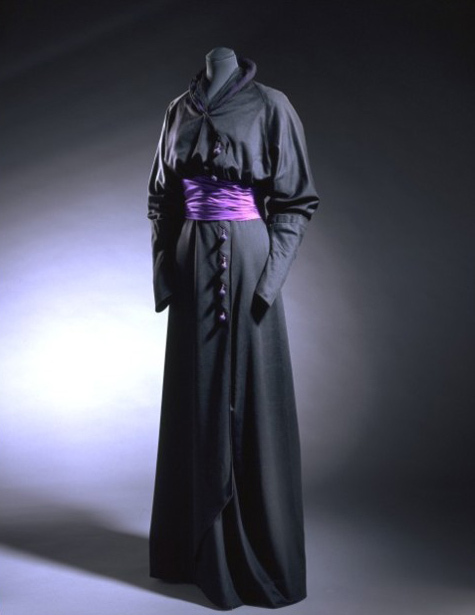 Here’s a half-mourning dress in the collection of the Victoria and Albert museum in London. This beautiful – and rather modern looking gown – was worn by Heather Firbank in 1910-1912 and designed by Redfern. It’s featured in the excellent V&A publication “Black in Fashion” by Valerie Mendes. So with this in mind, the colours of the cocoon coat no longer look like fashion and more likely are to be the later stages of mourning – when a lady is re-emerging back into Society and ready to enjoy herself again. Further information could be obtained by enquiring from the original owner, who may be able to recall or research when family members passed away, helping to pin down a date. I applied this knowledge to another ensemble in my collection – this luxurious skirt suit, that came to me via the Banana Room, a legendary vintage clothing shop in Adelaide. Like the cocoon coat, it features the colours of purple and pale grey – this time in reverse with a silver grey devore velvet stripe lined in purple silk crepe. Like many older items, it’s a mysterious suit with style elements from many eras: the glass and enamel buttons look Victorian, the fabric could be too, and it has been meticulously hand tailored by experts. At first sight I thought it must be late 19th century or early ’20 century were it not for the skirt length: but skirts are often updated when fashions change. Most telling are the large structured shoulder pads. I am not aware of ladies wearing shoulder pads prior to 1933, hence my dating of this suit as ’30s but there is no reason why a fashion innovator could not have requested such a detail earlier: perhaps she had admired those in her husband’s jackets and seen how they could rectify her own rounded shoulders? Perhaps they were inserted in later, although I doubt it as the jacket is so well made and shows no signs of alterations – you can always tell when shoulder pads have been added or removed, because the structure is built to accommodate them. Or not. Margot Riley of Sydney’s State Library was in recently and recalled seeing the suit in the Banana Room collection: it was originally going to be part of the auction in 2005 but was withdrawn. Margot is of the opinion that it dates to the late ‘teens and is half-mourning. Margot, I think you’re right. This is what I love most about vintage and antique fashion: there is so much to discover and learn, and how it adds depths to garments that we, in the modern age, can choose to wear as we wish. These were treasured pieces, worn for a transitional time in their original wearer’s lives but they’ve both experienced so much more since then and due to careful care, are now ready to be worn again or enjoyed as beautiful collectables of social and cultural history. If you’re interested in mourning dress, the NGV had a wonderful exhibition on Black in fashion in 2008 with some great examples of mourning dress. Their publication should still be available from the NGV shop. UPDATE: I think I have another item of half-mourning dress on the webshop – check out this beautiful crushed velvet purple cape with light grey cotton chenille flowers. Two lovely pieces, thank you for sharing them and your sleuthing with us. Really interesting information re mourning attire, after such good research! It’s great when everything falls into place! This is really interesting. 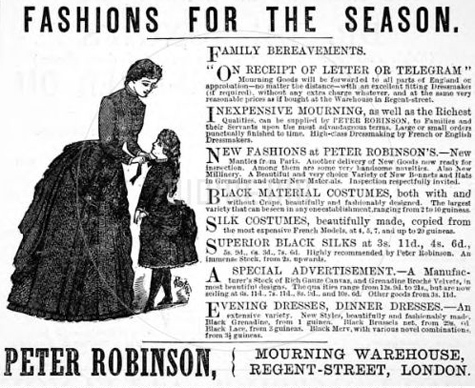 Peter Robinson’s – as a middle-range, fairly unadventurous women’s fashion store, was in existence until at least the 1970s, although clearly not selling mourning clothes! It must have moved up the road slightly, across the other side of Oxford Circus, as it occupied the same building as Top Shop does now and 254-262 Regent Street was department store Dickins and Jones until the 1990s. Wow! Loving all these stuff. Those are gorgeous. I love the silk velvet coat, looks really regal. The black one looks really nice, definitely an attire for mourning. Your outfit in the last photo also looks like victorian. It actually suits you.